Sam Range submitted these photos and caption. For this year's Cavalcade of Brass DCI Tour event in Naperville, Ill, thunderstorms were in the forecast, but all the corps still went through the typical preparations for competition. 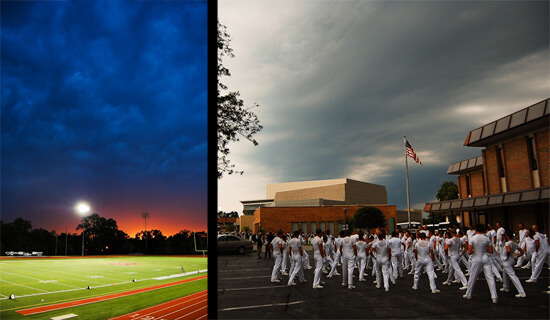 Under clear skies, Phantom Regiment suited up and began a visual warm up, but just as they started their stretches, the first line of storm clouds passed overhead. Phantom headed to the buses along with the other nearby corps. Officials had already halted competition under a rain delay and were herding fans to shelter. As a thick blanket of clouds formed overhead, the sun set, creating an eerie orange glow on the horizon. In a recent edition of DCI's official Field Pass podcast, host Dan Potter went behind the scenes at the Naperville event to find out what goes into the difficult decision of postponing or cancelling an event due to inclement weather. Listen to the Field Pass episode.